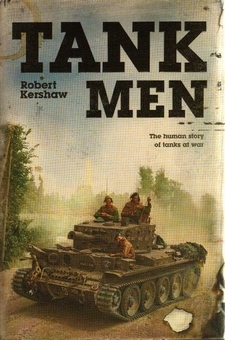 The author served in the British Army, including the duration of the 1990/91 Gulf war. This, his fifth book, covers a very popular military subject from a new angle. When the tank appeared on the battlefields of France and Belgium during the 1914-18 War, it introduced a major new approach to warfare. Armour was not new, only the combination of self-propelled machine, artillery and armour. Its purpose was similar to the armoured knight of the Middle Ages, a method of punching through infantry to disperse and destroy the opposing army. It was essentially a counter to the machine gun. In 1914, the opposing European armies still employed infantry and cavalry, with specialist units for engineering and logistics. It was assumed that the battles would involve the movement of armies in a series of attempts to avoid or bring to battle. The opening stage was a traditional dash by cavalry and infantry towards the opposing capital city. This German attack was halted by a small British force and a formal line of trenches became established as the machine gun dominated the battlefield and denied movement to either army. This resulted in a war of attrition as each side suffered massive casualties in an attempt to gain a few yards of mud and shell holes. Britain built the first tanks in an attempt to find a way past the costly impasse. Produced late in the war and in small numbers, the first tanks had an impact beyond their numbers, but they were not yet a battle winning weapon system. They were mechanically unreliable, but they did provide a mobile strong point that resisted machine gun fire and provided cover for infantry following them. When they first appeared they did create terror, but after the initial shock, the Germans began to develop their own primitive tanks and anti-tank systems. Viewed from the outside, the tanks has always been an awesome and powerful machine that seems invincible. Viewed from the inside, it is a cramped, noisy, smelly vehicle that is uncomfortable in the extreme and terrifyingly fragile to enemy fire. Rather than being a place of safety, it is all too frequently a trap that kills or terribly wounds its crews. In a continuing development battle the tank is frequently vulnerable to new anti-tank weapons. It is heavily dependent on a fragile supply line that brings fuel and ammunition, without which the tank is useless. The author has graphically demonstrated these realities through the comments of soldiers who served in tanks during WWII.